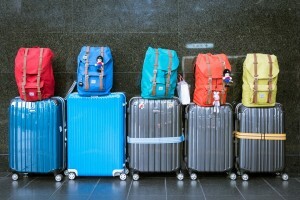 So you are going to Paris and you want to absolutely live it up? Well there is no better time to treat yourself in the city of lights than right now! We here at ParisByM have compiled a list of the absolute most glamorous, and luxurious things for you to do during your time here! So sit back, relax and get ready to indulge all of your heart’s desires! 1. Hot Air Balloon Ride Around Paris! For around $1,000 dollars an hour… you and one other person can enjoy a romantic hot air balloon over paris. Weather permiting, you and your significant other can sip champagne and take in all of the views over the city. This non-traditional, albeit definitely worthwhile, method of viewing Paris is the perfect way to treat yourself when first arriving and wanting to orient yourself to the city! 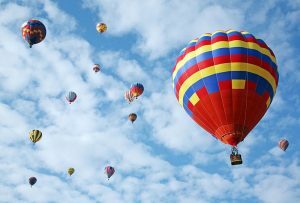 Interested in reserving your own hot air balloon ride? Look now further! Check out this link here! 2. Dinner And A Show At A Parisian Cabaret! From the Moulin Rouge to Lido…. Cabarets are the place to go if you are looking to treat yourself to a night of wild, entertaining fun! Prices will vary but you can enjoy a performance with dinner and a few glasses of champagne at the Moulin Rouge for around €190! But… since money is no object on your once in a lifetime trip to Paris… why not upgrade to a meal that is slightly nicer for around €210! These performances are world class with talent recruited from all over the world and showmanship the likes of which you have never seen! 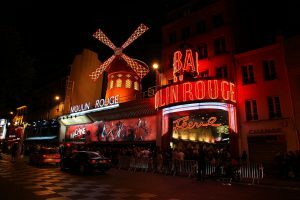 For more information on great cabaret performances in Paris… check out this great post we created here at ParisByM! 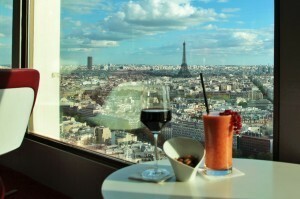 Paris is world famous for its sophisticated, chic, and simply delicious culinary culture. You will never exhaust yourself of trying all that there is to eat here in this foodie haven. 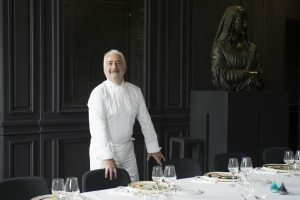 We here at ParisByM recommend splurging on a truly fantastic evening by dining at Restaurant Guy Savoy, where master chef, Guy Savoy, will take your taste buds to places they have never been before. So book that reservation, and embark on a journey to culinary excellence. Check out their website and menu here. 4. Go On A Shopping Spree At Galeries Lafayette! What better way to treat yourself than to shop until you drop right here in the fashion capital of the world. 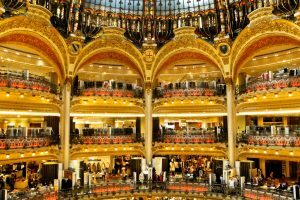 Galeries Lafayette is world famous for having amazing shopping! Here you can find all of the designer brands and more! Even if you aren’t the biggest fan of shopping… the sheer beauty of this place is enough to change that! Why not splurge and treat yourself to the latest stiletto by Vuitton or, for the men, invest in an Armani suit that is sure to impress all of your colleagues! Paris, and France, is famous for the many fragrances that it produces. 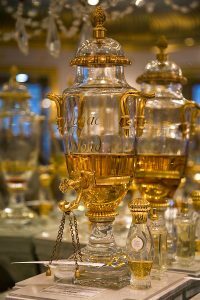 Check out the famous perfume house known as Parfums Caron. Here you can buy an original perfume called Poivre Perfume that runs for around 1,000 dollars per ounce. While this price-tag might deter some, if you are looking to treat yourself this is a great place to start. This perfumery has been operating for over 100 years and, unsurprisingly, they have learned a thing or two about their craft during this time. Looking for more info on where you can get a luxury perfume of your own… click here! We’ve all heard of it… many of us have dreamed for maybe one day having the chance to attend. So why not plan your visit so that you are here for this world famous event. Celebrities and the ultra-wealthy from all over the world come to check out the latest trends in clothing. World-acclaimed designers come to display their newest collections for both men and women. After attending this legendary event, you’ll return home both prepared for next seasons trends, and you’ll be the envy of all your friends. This is an absolute must for the more fashion-saavy amongst you looking to treat yourself. Need to take a moment to unwind after a long week of exploring Paris? Don’t worry, there are plenty of places to treat yourself to a luxury spa day. We here at ParisByM recommend heading on over to the CHI spa, at Shangri La Hotel, to take a dip in their magnificent pool after a nice long massage… Whatever your needs are… you are sure to leave feeling both rejuvenated and ready to embark upon your next Parisian adventure! 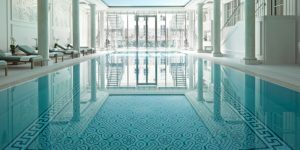 Check Out This Link To Great Spas In Paris! 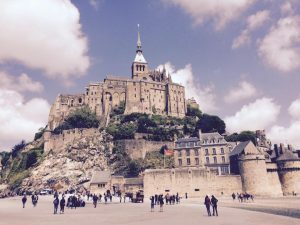 Why Visit the Mont St. Michel? Mont St. Michel is perhaps easiest, and cheapest… to access via car. Although lines to park near the city can be very long in the morning so it is best to plan for this accordingly. 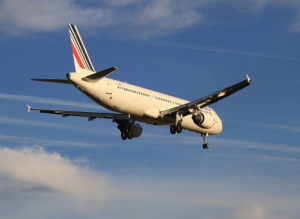 While traveling in Paris, however, most will not have access to a vehicle. Rest assured that, while there is no direct rail access, getting to Mont St. Michel from Paris via public transportation is quite possible. You actually have several options in how you will do this. Your first option is to take a bus directly to the point of mainland just adjacent to the island. From here… you will be able to walk on the causeway to the fortified city. Bus tickets are relatively inexpensive and, even if you purchase them at the last minute, can be bought for as little as around $50 dollars. Be warned though, the journey by bus is a long three and a half to four hours… It might benefit you to bring some snacks and beverages along for the ride. Your second option for transportation is to take a train… We recommend taking the TGV from Gare Montparnasse to Rennes. Here you can find a bus run by Keolis Emeraude that will provide you with a 90 minute journey to the island. 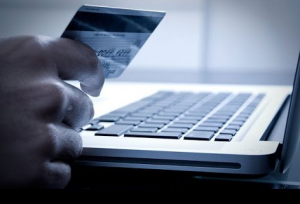 With both options, we recommend checking for any discounts you may be eligible for. People under 25 and over 60 are usually eligible for marked down prices. 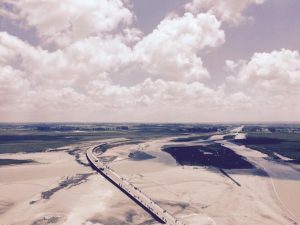 Mont St. Michel is a tidal island surrounded by mudflats and farmland. At low tide… it is technically possible to approach the island through the mudflats, although this is not advisable. Not only does the marshland surrounding the island often times contain quicksand, but the swiftly incoming tide can create hazardous conditions for anyone who does not know what they are doing. We highly recommend that, should you wish to explore the mudflats, you do so with an experienced tour guide (click here for walking tours). Otherwise… it is best to approach the island via the well maintained causeway that connects it to the mainland. The city itself, currently the home of approximately 44 permanent residents, has long maintained strategic fortifications. Its highly defensible position made it difficult for armies to successful mount an assault against the castle. The incoming tide would either strand, drown, or block out invading attackers. Ironically, the structure of the town closely mirrors the feudal society which built it. God sits at the top in the heavens, the abbey and monastery just beneath that, then the castle’s living quarters, then the town and shops, and outside of the fortress there were fields for peasants to work in. Visitors to Mont St. Michel have the capability to ascend to the top of the mountain and take in the view from the Abbey. The panoramic views that this hike will afford you are nothing short of spectacular. It is for us, the best part of any trip to Mont St. Michel. Entrance fees to the Abbey will vary depending on your age and nationality. The standard ticket price for adults over 26 is €9. If you are under the age of 18, an EU citizen between the ages of 18-25, or disabled… entrance will be free for you. 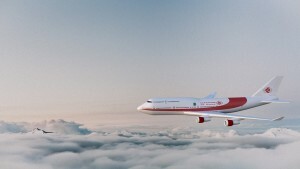 For more details on admission prices and hours of operations… click here. 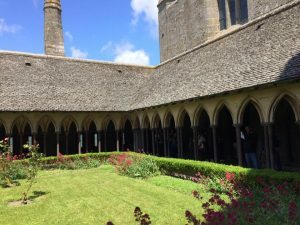 When visiting the abbey you will be able to explore over 20 different rooms and multiple outdoor gardens. You will find many great halls, and chapels that once housed the monks who resided here. When visiting the abbey… comfortable shoes are an absolute necessity as you will find yourself climbing up and down old steps on more than one occasion. The winding village below the castle is a treasure begging to be explored in its own right. Here, while the crowds of tourists can at times feel overwhelming, you will find several cute cafés, shops, museums and gardens. We recommend stopping and sitting down at a restaurant to rest and refuel after your hike to the summit. You will need it. Keep in mind that entrance to the town itself is free of charge but prices at cafés can be a little high meaning that if you are looking to travel on a budget, you may want to consider packing your own lunch to take with you! If you are feeling like an splurging though, the restaurant La Mère Poulard is famous for its omelette recipe which has been satisfying wary pilgrims long before it ever did tourists. 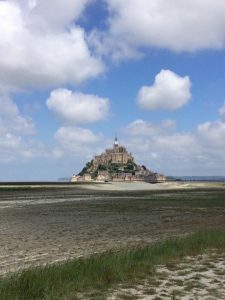 If you are looking to stay in Mont St. Michel overnight be warned that while a few hotels do exist on the island, they are very expensive and usually book reservations well in advance. Plan accordingly! We recommend that you, instead, stay at the nearby pirate city of St. Malo. Don’t worry… immersion in the Norman landscape is inevitable and your first experience with it will be your journey from the bus-stop/parking lot to the town itself. 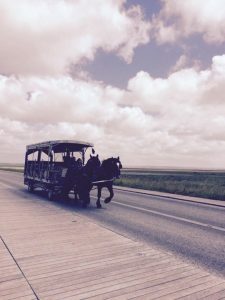 While we definitely recommend enjoying a nice scenic walk over to the island, if you are pressed for time or have difficulty staying on your feet… you may also take a trolly or even a horse drawn carriage over to the city. You may want to take your time though. The countryside surrounding the mont has just as much to offer travellers as the town itself. 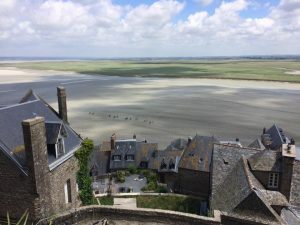 Not only do you get some of the best views of Mont St. Michel from afar but, from out here, you can explore the surrounding area by land, air or sea. Whether you want to go on a horse back ride through the mud flats, kayak through the bay, or view the surrounding landscape from a hot air balloon… there is something for everyone to enjoy! 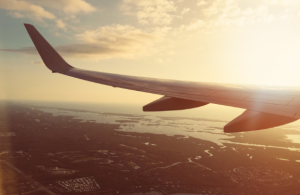 Ready to Plan a Trip of Your Own? Don’t worry! ParisByM is here to help you! 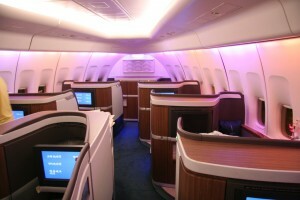 We have designed several packages that will allow us to make your trip as convenient and worry free as possible!